Agenus has two in-house GMP manufacturing facilities located in Berkeley, CA (Agenus West) and Lexington, MA. Agenus West was acquired from XOMA in 2015. With 20-30 years of experience in technology transfer, process development and antibody manufacturing, the team at Agenus West is blazing forward with industry-leading efficiency and speed. Today, we can deliver clinical grade material from research cell bank in ~4 months, which is 3-4 times faster than the industry average. Agenus West has streamlined manufacturing by working closely with our cell line development team in Cambridge, UK, to ensure that all our cell lines meet eligibility requirements for commercial manufacturing. Agenus West also strives to bring in cutting-edge technology platforms that enhance manufacturing speed, cost efficiency, operational flexibility and technology transfer- all with the goal of delivering our innovative therapeutics to patients with lightning speed. 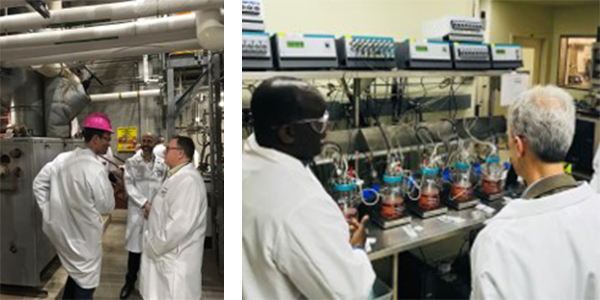 Agenus’s in-house GMP manufacturing facility in Lexington, MA produces both autologous and individualized cancer vaccines as well as QS-21 Stimulon® to support clinical studies. The manufacturing space is designed with multiple segregated workstations to allow the manufacturing of multiple patient batches simultaneously and is supported by a materials and product storage area in addition to Quality Control laboratories. The manufacturing team works closely with the clinical and quality teams to ensure rapid and efficient vaccine production where time to patient is of the essence. Upon arrival of patient tumor or completion of neoantigen peptide synthesis, individualized vaccine batches are manufactured in days to be ready for quality testing followed by disposition and shipment to the patients.